Retriever training can seem complicated. And in some ways, it is. But I find it helps to have a clear path to follow, a plan. This helps us to make our way from one step, to the next, without worrying too much about the final destination. Now I appreciate that there are many different paths we could take. But sometimes when we are just starting out, we just want someone to tell us ‘the way’ – not to hear a dozen different ways and try to pick one that sounds suitable. That’s what this post is about. Let’s look first at what’s involved. As you can see this flow chart, there are two types of retrieve, and these both share some of the same key training processes – that’s the list in the middle. Let’s have a quick look at these components of the retrieve. 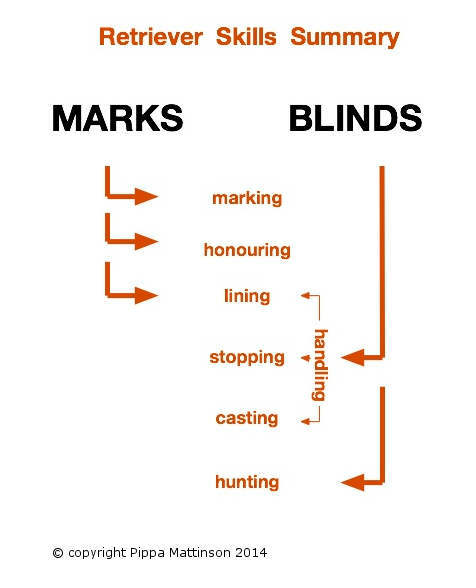 Marking and honouring are not required for blind retrieving. In theory, with good marking and lining skills, a dog being sent on a mark should not have to be handled too much. In practice of course, sometimes the dog will not mark accurately enough. And will need to be handled. Very often the novice trainer has no idea what order to teach these skills in. Fortunately, in some cases it doesn’t matter. In other cases the skills involved need to be built on other skills, so these foundation skills must come first. Or at least progress at a parallel rate. There’s not much point teaching a dog to handle left and right at 200 yards, for example, if you can only stop him on the whistle three feet away. So in many cases we work on one skill a little, then on another, then back to the first again, so that we make progress evenly across the two skills that are interlinked. We make a little progress in one direction, and then a little progress in another. Marking is the most basic form of retrieve. The dog sees you throw a dummy and races after it. With a little practice, he gets better at judging distances and building mental pictures of where that dummy is located. At first, marking is about the eyes, rather than the nose. Later, as the marks get more complex, more distant, and fall into thick cover, we’ll be relying on the nose a lot more. But with marking, the eyes should be what steers the dog whilst his retrieving drive powers him forward to the area of fall. The reason we need to be careful to break this process down into stages, is to make sure we don’t’ damage the engine that powers the dog – his desire to retrieve. We can’t practice so much that the puppy loses his desire. Nor make the challenge so hard that the puppy loses his confidence. Marks need to be short at first. If they are too far away, the puppy will start hunting before he reaches the area of fall and this is something you want to avoid. Because we want the puppy to use his eyes, not his nose, at this point, we start with short marks on an open clear surface, then progress to longer marks still on an open clear surface. We also follow an important training rule: when you make one aspect of the task harder, make all the other aspects of the task easier. So when we progress to retrieving in short cover, we go back and make the marks shorter. Lengthening them slowly as the dog’s skill grows. When we move on to deep cover, we repeat the process again, throwing very short marks to begin with, then making them gradually longer. The problem is, if you then apply this process to all the other skills involved in retrieving, and then try to combine them, you can see just how complicated things are becoming. Do you start teaching the stop whistle before or after introducing marks in cover? How far should your dog be lining before you introduce remote stops? What about casting? Does that come before lining or afterward? How much progress with casting should you make before you start cold blinds? There is no single right and wrong answer. So if your brain is melting with it all, I am not surprised! Trying to make sense of all this is one of the aims of the Gundog Club training scheme, which breaks training down into individual stages using grades. At each grade the various skills you need are testing and the levels of difficulty increase incrementally as you work your way through the system. Each requirements of each grade dictate how far along you should be, in each of these skills. 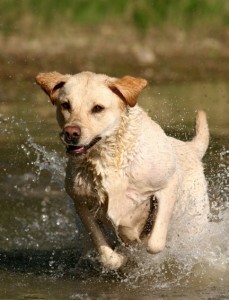 Retriever training combines your dog’s natural instincts with a range of learned skills. No two trainers will follow the exact same route to a fully finished retriever, and this can be very confusing to newcomers to our sport. Combining all those skills together to build a solid retriever training programme, is not always easy. Over the next few weeks I’ll be looking at those grades and showing you how you can fit your retriever training programme right into them. So that it makes sense, and so that you make progress evenly, across all the skills you need to build an efficient retriever, from the ground up. Retrieving is one of the most popular topics on the blog, so do let me know what you find most challenging, and where you most need help and information.